Avalon Tapestry II offers ultimate luxury, with Deluxe Staterooms in addition to Suites. The ship boasts two decks of Panorama Suites, ensuring guests won't miss a moment of stunning scenery. 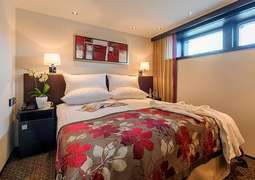 The accommodation aboard the Avalon Tapestry II is composed of suites and state rooms which are all large and contain many modern amenities such as comfortable large beds, refrigerator mini bars, Satellite flat screen TV’s and large wardrobes. All cabins are outside with options for full panoramic windows and balcony’s which all promise wonderful scenery and the comfort you desire. Dining aboard the Avalon Tapestry II will leave no person unfulfilled. 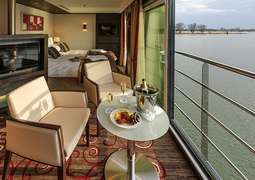 You will be introduced to your stay with The Captains reception with sparkling wine and canapés, followed by a welcome dinner. The ample breakfast buffet with sparkling wine and complimentary juices is a great way to begin the day. To create the perfect setting for your meal enjoy our spacious Dining room, you can also admire the views at the Panoramic Bistro. You will be delighted by our seasonally and locally inspired cuisine using freshly sourced-ingredients. Complimentary drinks are also served with meals. During the day enjoy the tasty selection available at the lunch buffet or relax with afternoon tea. Or for the particularly restful, room service is available with continental breakfast and a range of drinks. The dining experience of your stay will be thoroughly enjoyed and rounded off perfectly with a farewell meal. You will be fully entertained throughout your stay with a choice of excursions and activities to suite any taste. However you don’t have to leave the ship to be entertained and experience the local culture with local chefs, guest lectures, entertainers and artisans delivering you memorable experiences. Wi-Fi access is available throughout the ship. Enjoy Movie nights and on demand in room entertainment. Exercise in the fitness studio or relax in the Sky Deck with premium lounge chairs, shade system and whirlpool. Just because you are relaxing and enjoying your holiday doesn’t mean you have to forget your Health and fitness routine. The fitness studio is newly refurbished with all the equipment you need for your exercise. Healthy food options are available with lighter and low calorie choices available for every meal. There are light exercise and relaxation excursions such as biking excursions in Amsterdam and Breisach. The ship also has a non-smoking interior and if you feel like a bit of pampering there is a hair salon.